We're pleased to announce that SignComp Europe is now the official UK distributor of Vista System products. 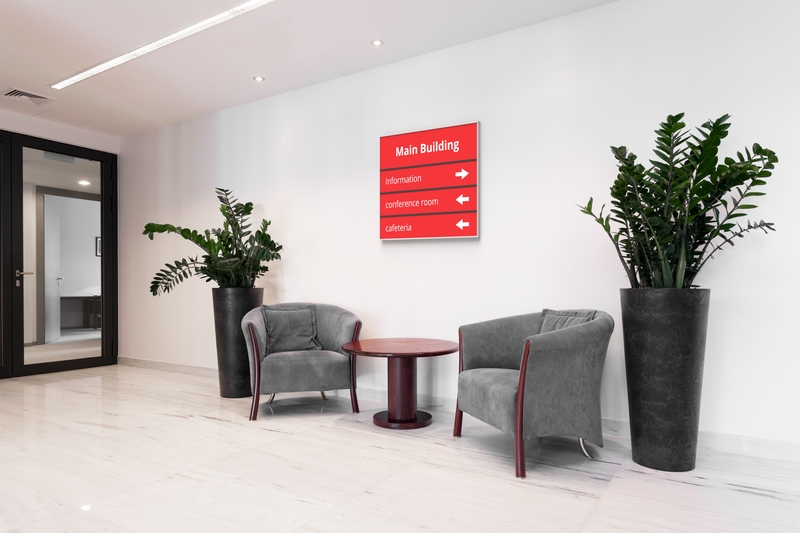 Vista provide a complete suite of way-finding and directional signage systems perfect for internal and external spaces. Vista System is renowned within way-finding signage and are known for providing products of the best quality materials to the highest industry standards. Here at SignComp Europe, our product portfolio has grown once again and we will now be offering these outstanding products to all our customers in the UK. Vista System way-finding products are designed with simplicity in mind and can be installed with a vast amount of substrates and manufacturing methods, meaning you can achieve various different results, all with the same frame system. The materials and methods covered in this include printed paper, engraved, embossed, screen printed substrates, photo-metal, photo-polymer, vinyl graphics, photo-luminescent safety, braille, tactile and much more. All Vista System frames are fully compliant and support ADA (Braille) technology inserts resulting in directional signage suitable for everyone. Vista’s products also come with a lifetime warranty (under normal working conditions), so you can have peace of mind when choosing from the range. At SignComp Europe we provide a selection of quality signage products and systems from the Vista System portfolio for all our customers and clients across the UK. The two main products SignComp Europe will offer from the Vista portfolio are the Vista Sharp and the Vista Curved systems. The Sharp is a brand-new signage system that is known as one of the most innovative, flat, frameless and sleek looking indoor signage systems on the market. The Sharp frame can easily be installed with various substrates from paper inserts to rigid graphics. On top of that, with the addition of metal inserts into the frame and magnetised strips onto your substrate, installation is made even easier with a magnetised substrate that simply clicks into place. Our second product range is the Vista Curved system which features a curved face for that slightly softer look. Again, the Curve system can easily be installed with various substrates, so you can achieve the aesthetic you want. We supply TWC (The Wonder Curve) systems, the next evolution in the Curve range that results in lighter and more cost-effective results. The Vista Sharp and Curved systems are perfect for a number of requirements, from small to large applications and both ranges will easily blend into any commercial, business, retail and hospitality environment. Wall Frames – Wall-mounted signs using the Vista frame extrusions using any flat, flexible substrate to create a flat or curved-face sign. Projecting Signs – Our flag signs can be made for almost any size and can be connected with double sided tape or pre-drilled mounting holes. Directories – Vista System directory signs are fast, easy and simple to assemble, easy to change and install and can use any design of artwork. Table Stands – “Does what it says on the tin”. They’re ideal for desk or table top surfaces and are easy to assemble and are quick to change graphics. Double Sided Pylons – Pylon signs are great for free-standing areas such as retail spaces to highlight to customers what they can expect to find on each floor. Suspended Signs – Vista profiles which are simply hung from the ceiling to maximise visibility over large areas. Post Pylons – Similar to the doubled sided pylons just simply one-sided. Ideal for hospitality spaces such as hotels and leisure facilities. Poster frames – The perfect solution for posters and POP advertising. Should you be interested in any of the Vista System signs and products available at SignComp Europe, take a look at the selection of products we have available, you’re bound to find something to suit your requirements. All of the products we provide are manufactured to the highest quality and will stand the test of time. Customer Testimonial - "The usual high standard we expect." "The signage order recently received from yourselves was delivered in a timely fashion, the product was manufactured to the usual high standard we expect from Vista System. As consequence we would have no hesitation of using this product again as and when the opportunity arises." Customer Testimonial - "The perfect solution." "We were looking for a system which would allow our client to change the content of the slat themselves easily but was also waterproof for outdoor use. The Vista system was the perfect solution and the finish suited our back panel really well. This was used at a high-end hotel and the Vista system really kept the sign in keeping with the overall look of the hotel."